Some street food vendors take a fancy approach to their offerings. The approach to Neua Wooah Rai Tiem Taan to the classical bowl of beef noodles is using pieces of marbled kobe beef. 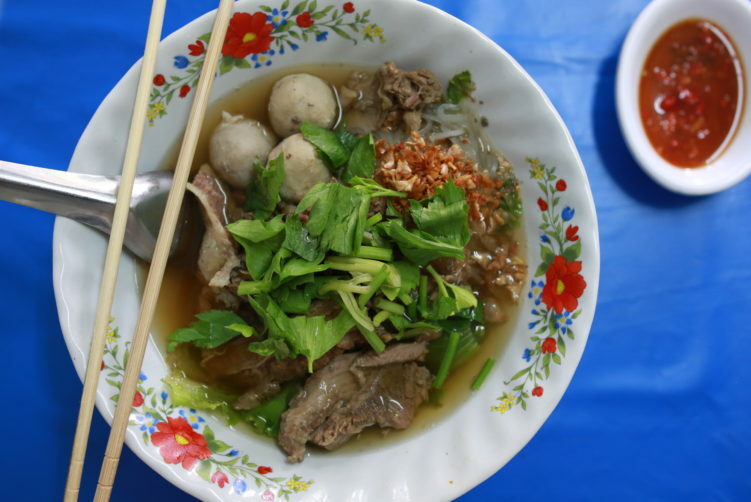 The stock itself is a rather light broth, contrary to the murky stock served at many other beef noodle vendors, such as Wattana Panich. It is mild and elegant, but distinct. It comes with a dipping sauce, prik nam som. You should pour some of the dipping sauce into the emtpy bowl put in front of you, then take soome noodles and meat from your main bowl and mix it with the dipping sauce before you start digging in. The dipping sauce is sour and spicy and is called prik nam som in Thai. It’s a very typical ingredients, used as a condiment for many noodle dishes, espeially beef noodles. It comes in many variations. Chili and (Thai) vinegear is used in almost all of them and many also add garlic and/or sugar and lime. The beef is tasty, but not spectacular. It’s a good and solid bowl. What lifts Neua Woah Rai Tiem Taan to a vendor worth visiting if in the area is a good bowl in combination with a very good prik nam som. The dipping sauce adds a perfect acidity to the dish. The bowl is topped with some fresh lettuce and fried garlic. Neua Woah Rai Tiem Taan is a typical local area centered family business on the outskirt of Ratchawat main drag. The little kitchen is just outside of the hole in the wall. A few tables are set up inside. Little English is spoken, but they understand what you come for as they only serve one dish. If you ask for water to drink you get the usual cup of water and no bottle. But dont worry, it’s fresh and tasty, a lot better then what you buy on any bottle. 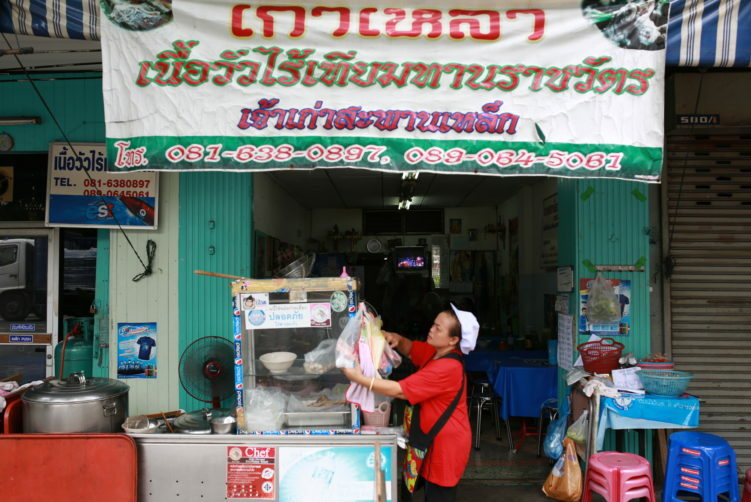 Ratchawat Market is located near by on Nakhon Chaisi Road, in between Sawankhalok Road and Rama V Road. 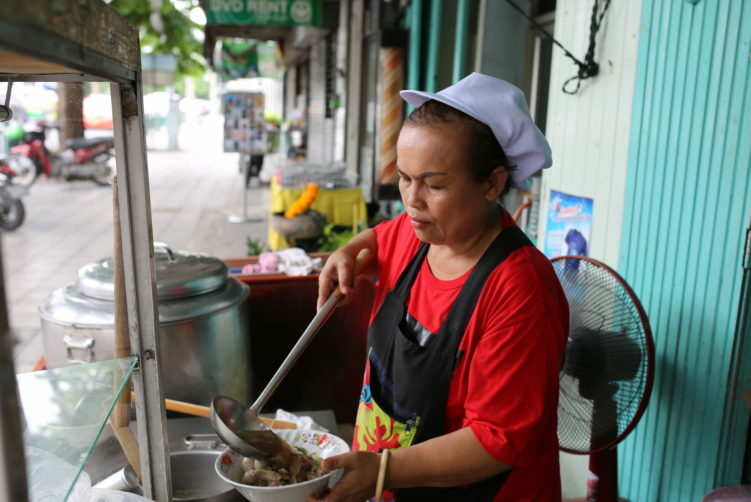 The area has plenty of very good street food options. You find some of my recommendations for Ratchawat and Sri Yan here. click here Address: 500/2 Rama 5 Road. 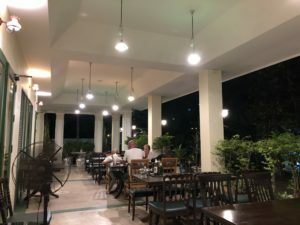 How to get there: You find Neua Woah Rai Time Taan 30 meters away from the corner of Nakhon Chaise road and Rama V road. You see some trees around the shophouse. Best way to get there from down town is to take the BTS to Victory Monument and a 15 minutes taxi drive from there. Or you can choose the waterway. From Payap pier it’s a five minutes taxi drive or 25 minutes of walk (just follow Nakhon Chaisi road until you reach Rama V road. If you’re on a budget get of at Victory Monument Station, walk the sky walk towards the monument and turn left to get to down to the bus stop. Get on the No. 14 bus. The conductor will shout out the name of each stop. So, listen carefully. The journey takes about 15 mins. Nua Wooah Rai Tiem Taan has a twist to the classical bowl of beef noodles. She use pieces of marbled kobe beef. The dipping sauce (prik nam som) adds a very nice acidity and makes a perfect combo with the beef noodles. See full review at StreetsideBangkok.